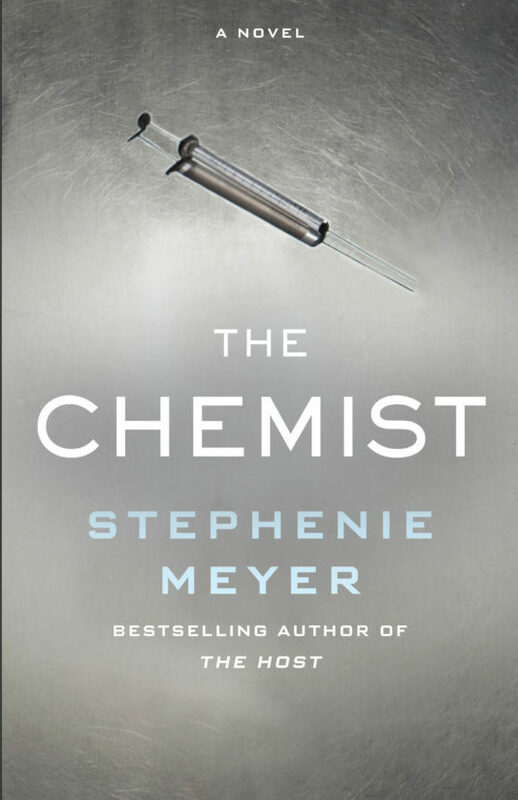 The Chemist is Stephenie Meyer’s new book, about a former government torturer who is now on the run from her handlers who want her dead. But when they bring her on for one last job, promising to leave her alone if she cooperates, she decides it’s worth the risk. Read on for the full book review. I feel like it’s not cool to like Twilight (or really any Stephenie Meyer books), but. . . whatever. I thoroughly enjoyed Twilight. I read it because a friend handed it off to me and I got to read it without any of the hype and baggage that came along with it as it became wildly popular (which may explain why my review of it, written a decade ago, is definitely heavy on the fan-girl side and kind of embarrassing for me to read now). Also, of course I went to see the movie on opening night. When I wrote a review of the New Moon movie, it was my 19th post that was about Twilight in some form or another. All of which is to say, I get a big kick out of Stephenie Meyer books and I don’t hold them in the same contempt that many readers do. Of course, I haven’t read any Stephanie Meyer books in the past six years and I never saw either of the Breaking Dawn movies or The Host, so my love was clearly not of the eternal vegetarian vampire nature, but it definitely had its moment in the sun. Anyway, when I saw that she was releasing a new adult novel, The Chemist, there was no question I was going to read it. And it was just SO fun. A decade later and after reading approximately ten million criticisms of her writing and plotting and whatnot, I recognize some of her shortcomings as an author, but that doesn’t keep me from just enjoying it from the first page until the last. Actually, Alex isn’t her real name because Alex is on the run from her former U.S. Government employees who are trying to kill her. So real names and any sort of regular life are things of the past. The Chemist starts out as she moves from city to city, changing her name and identity at each stop and being as nondescript as possible. But then, when she stops in a library in a tiny town in the middle of nowhere, she’s contacted by one of her former bosses, Carson, who apologizes about the whole “we’re trying to end your life” business and asks her to come back in on a new bio terrorism case. Alex is wary (as you would be too if you slept in a bathtub with a gas mask on with a dummy in your bed to trick invaders and twice in the past little while, invaders actually HAD broken in and tried to kill you), but she’s convinced enough that she returns to DC to meet up with Carson and hear him out. Her former role with the government was in one of the intelligence agencies working in interrogation. Her speciality is chemical interrogation (hence her nickname “the Chemist”) and she’s extremely good at what she does. When Carson shares the details of the threat with her, she decides that the threat is big enough to take the risk for and she’s soon taking on a last job that she hopes will get the government off her back for good so she can return to a normal life (or at least the kind of life where you don’t sleep in a bathtub with a gas mask on). Obviously, things don’t quite work out that smoothly. Two things I’ve always enjoyed about Stephenie Meyer’s books. One, I think she’s funny. As I listened to the audiobook, I laughed out loud multiple times at the dialogue. Second, say what you will about her actual writing, but I think her plots are very fun and engaging, and this one was no exception – I loved watching the story unfold and all the twists and turns in took. Is there a love story? OF COURSE THERE IS. This is Stephenie Meyer we’re talking about. Does it become almost immediately a “love of a lifetime, never knew I could feel like this, pledge my life to you, probably while we’re being threatened with guns” kind of love. OF COURSE IT IS. It is what it is. You cringe a little, you move on. Or at least, I did. Also, Alex is a really strong heroine. She’s super independent (as you’d have to be if you were going to live on the run for several years) and she’s smart and capable. Frankly, she was so tough and independent that I couldn’t help but wonder if it was a reaction to the ten billion criticisms of Bella Swan over the last decade. But maybe that was just me reading too much into it. One warning – The Chemist is VIOLENT, although not graphic. I’ve watched six seasons of 24 and it still gave me a shock every time one of the main characters shot someone in the back of the head (usually twice, just for good measure). Maybe watching all of Person of Interest where the worst thing that ever happens to a bad guy is that they get shot in the kneecaps has lowered my tolerance for actual death. Either way, I’m clearly not cut out for life on the run or for being a government agent. Regardless, it was as much fun as I’ve had reading in a book in quite some time, where I just wanted to listen and listen and listen. And, I have to admit, I’m kind of feeling the urge to go read Twilight again. I love this post! I really enjoyed Twilight at the time. Now that I have broadened my reading life a bit, I don’t think I’d like it as much as I did then, but I feel the same way you do about Stephanie Meyer’s writing. I can’t wait to check this book out – it sounds fun!! I really enjoyed Twilight at the time (although I was about 14 when I first read the books as part of a book club at my local library before they became wildly popular). As time went on though, I realized that 1) Meyer’s writing struggles a bit and 2) The romance is (almost) everything that’s wrong with what society teaches teenage girls about love. So, those are my big beefs. I do agree though that her plots are insanely fun to read, so… pros and cons. I’m excited to read this one! When I saw you talking about this post on your instagram story yesterday I immediately went and added the book to my TBR on goodreads. I’m not sure how it went under my radar for so long, but I’ll be putting the audiobook on my holds list on overdrive shortly. I love that you love Twilight! I hadn’t heard of this one but I’ll definitely be putting it on my to read list. On my hold list immediately! Twilight was obviously not “well written” but I enjoyed it. I also was at a point in my life that I had hit a major depressive episode, so they were my lifeline of sorts. They’ll always have a special place in my heart. There were a lot of Stephanie Meyer haters, but I never really understood why. I guess people like to be disagreeable and pick on anything popular. I liked Twilight, and The Host, but I didn’t realize she put out another book, so I’ll have to bookmark this one to read! I picked this book up at my library after reading your review and LOVED it! Thanks so much for the recommendation!